I had the pleasure to present at the recent Data Innovation Summit in Stockholm. Although the weather was a little colder than the average temperatures for March, I really enjoyed the city. It is definitely one place where you can see different perspectives and new ideas. I presented on effective ways to distribute knowledge from data science to business users. This is best done by enabling all users within an organization to combine their human intuition with machine learning, without the need to know anything about the underlying algorithms or data models. Here are some highlights from the session. 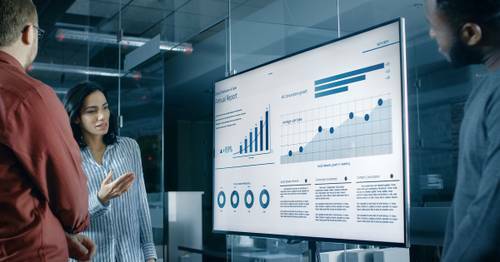 Pervasive business intelligence remains elusive, with BI and analytics adoption at about 30% of all employees based on a Gartner survey for Business Intelligence and Analytics adaption. The major reason is that analytics tools still require significant subject matter expertise to find the right data, ask the right question, and interpret the results correctly in order to achieve tangible business outcomes. With the use of AI-enabled features and experiences, BI adoption will expand as ease of use increases. The users will leverage more data easily in a governed manner, extract insights more effectively, and turn it into actionable insights. AI won’t replace business intelligence tools or teams, but BI tools and teams that leverage AI will replace those that don’t (this Harvard Business Review article shares good perspectives on a relevant topic). No matter how much data and insights AI enables, a human is still required to interpret the insights, make decisions, and act on them. There is a need to design new user experiences supporting Augmented Intelligence, which will bring human, data and algorithms together. The use of AI in BI and analytics can move the users up on the analytics cognitive scale. 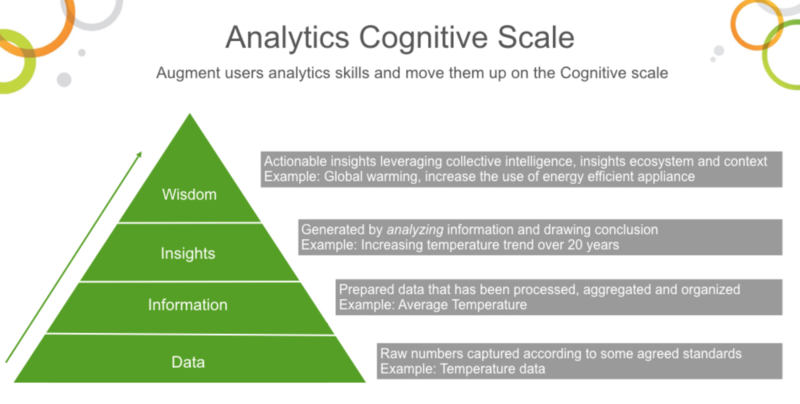 I define the levels of a cognitive scale for analytics as Data, Information, Insights and Wisdom. Data is the raw numbers that are captured according to some agreed standards, for example temperature data. 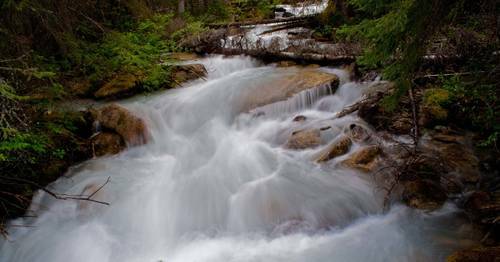 Information is the prepared data that has been processed, aggregated and organized. An example would be average temperatures in Stockholm in March. Insights are generated by analyzing information and drawing conclusion. An insight is gained when the user has the “aha” moment with the information provided. For example, recognizing the increasing temperature trend over 20 years is an insight. Wisdom happens when an actionable insight is gained by leveraging an insights ecosystem, experience, collective intelligence and context. Today most BI tools can only move users up to the 2nd level, the “Information” scale, with visual analytics capabilities. 3. Platform Scale: Scaling users with AI not only requires the use of algorithms but also an analytics platform that can scale to support many users with large amount of data. This is where concepts like hybrid cloud becomes important. Hybrid cloud is a cloud computing environment that uses a mix of on-premise, private cloud and third-party, public cloud services with orchestration between the platforms. Hybrid cloud supports the two largest hurdles for Augmented Intelligence; abundant and affordable computing, and a channel to leverage large volumes of data. 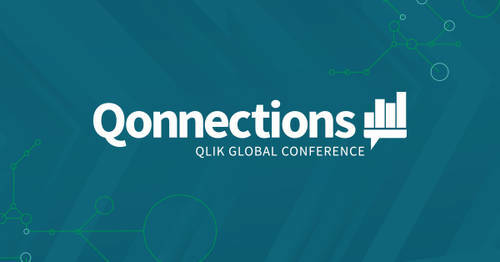 We will be sharing some of our exciting innovations in these areas at Qonnections on April 23-26. I am super excited and I look forward to seeing you all in sunny Orlando! 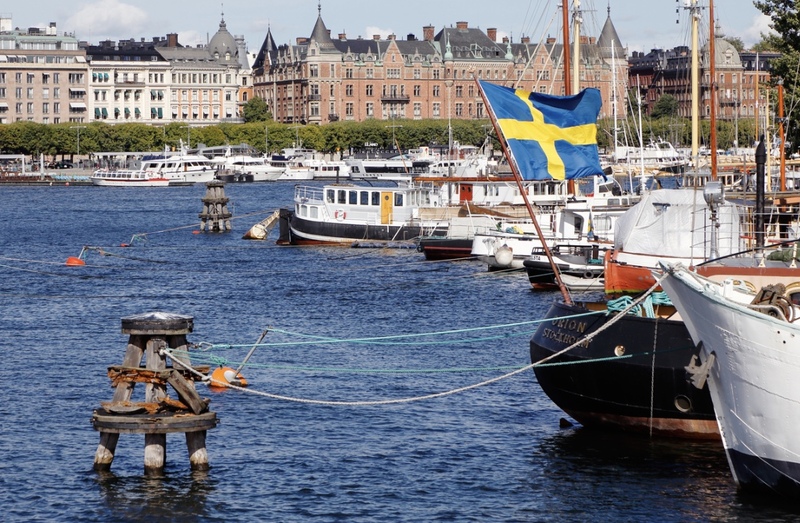 Elif Tutuk is sharing some highlights from the Data Innovation Summit in Stockholm!